Colleen Meyers; CARLA UMN Presentations: "The Mirroring Project"
Click HERE to read more about "mirroring" in pronunciation teaching. Click HERE to read about other teaching techniques in pronunciation teaching. Richard Cauldwell; British Council Seminars: "Accent and identity and insecurity"
An accent is a flavoring or coloring to your voice - which - within the same language and dialect - sounds different in some consistent rule-governed way from another given accent. 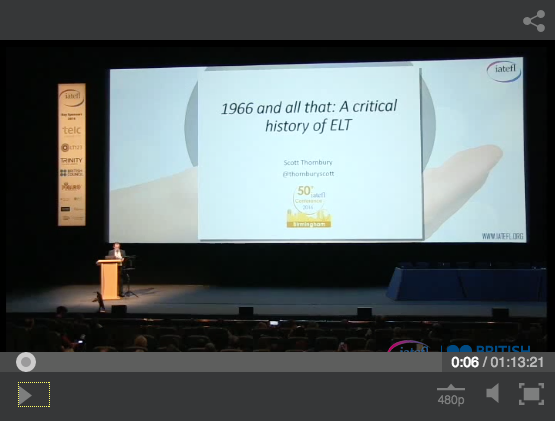 Scott Thornbury; IATEFL Online: "1966 and all that: A critical history of ELT"
The history of pronunciation teaching is interwoven with the history of English Language Teaching. This plenary looks at the history of ELT and shows materials from the last 50 years. Although Thornbury does not focus on pronunciation, this plenary helps to contextualize the teaching of pronunciation in the wider context of language teaching.